Telematics is a smart solution which connects a vehicle to a data/analytics center, thus enabling the tracking of its condition during various operations. The advanced level of telematics is the integration of human psychology or human behavior with data collected in real time. A major emerging market within the automotive telematics industry is the insurance market. Automotive telematics insurance has been in the market since the 1990’s, though its penetration level in the conventional insurance domain has been very low. Since 2005, the market activities such as emerging technology players in Europe and North America, growth in telematics system in vehicles, advancement of smartphone capabilities, and low cost of networking and communication have led to exponential growth. The growth of social media has resulted in a higher application-based online user time, thus widening the scope of app-based smartphone services. Significant countries which have deployed automotive telematics insurance are the U.S., the U.K., Italy, Canada, Singapore, and Japan, among others. An insurer utilizes telematics digital opportunity to enhance its automotive insurance business model. The advantages of automotive telematics insurance are throughout all levels of the supply chain. It can increase the profitability for the insurer and end user, higher customer engagement and feedbacks, and induce a sense of safe driving through various direct/indirect programs. The global automotive telematics insurance market supply chain has the following levels: service/platform solution providers, device manufacturers, insurance companies, system integrators, and end users. 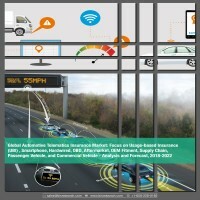 • What are the major market drivers, challenges, and opportunities in the global automotive telematics insurance market? • What is the service flow in the global automotive telematics insurance market? • What was the market value of the leading segments and sub-segments of the global automotive telematics insurance market in 2017? • How will each segment of the global automotive telematics insurance market grow during the forecast period 2018-2022? • What are the factors which influence the market demand for various devices used in the global automotive telematics insurance market? • How will the industry evolve during the forecast period 2018-2022? • What are the key developmental strategies that are implemented by the key players to sustain in this market? • Who are the key players in the automotive telematics insurance market and what are their contributions? • What are the region-specific key growth factors that would drive the market through the forecast period for the Americas, EMEA, and APAC? • What is the scope of automotive telematics insurance in the emerging economies of APAC? The report includes an exhaustive analysis of the geographical split into the Americas, EMEA, and APAC. Each geographical region analysis details the individual driving and restraining forces acting in the market in addition to the key players from that particular region. The report examines the role of the leading market players involved in the industry. The Company Profiles section includes highlights of significant information about the key companies involved along with their financial positions, key strategies, and developmental activities of recent years (2015-2018). Some of the key players analyzed in the report are Octo Telematics, CalAmp, Agero Inc, AXA Group, Cambridge Mobile Technology, Intelligent Mechatronic System, The Floow Ltd, The Progressive Corporation, TomTom, Trakm8 Group, and TrueMotion Inc, among others. Table 6.2 Vehicle categorization in the U.S. and the U.K. The innovation in the automotive ecosystem is led by connected car technology which is an essential part of the smart vehicle architecture. The increasing number of research and development (R&D) activities for autonomous driving has resulted in significant demand for the emerging technology in the market. Telematics is a smart solution which connects a vehicle to a data/analytics center, thus enabling the tracking of its condition during various operations. The advanced level of telematics is the integration of human psychology or human behavior with data collected in real time. A major emerging market within the automotive telematics industry is the insurance market. Automotive telematics insurance has been in the market since the 1990’s, though its penetration level in the conventional insurance domain has been very low. Since 2005, market activities, such as emerging technological players in Europe and North America, growth in telematics system in vehicles, advancement of smartphone capabilities, and low cost of networking and communication, have led to exponential market growth. The growth of social media has resulted in a higher application-based online user time, thus widening the scope of app-based smartphone services. Significant countries which have deployed automotive telematics insurance are the U.S., the U.K., Italy, Canada, Singapore, and Japan, among others. The automotive industry faces several issues such as control on environmental emissions, growing road safety concerns, and cost optimization of various resources within the supply chain – all of which together account for a major share of research investment. These issues can be resolved by understanding the customers’ (drivers) and their driving ecosystem. In-cabin smart service integration is one of the solutions that aim to reduce a commuter’s effort to perform various activities while traveling in the vehicle. The key for the automotive industry is telematics, which has the ability to drive smart vehicle system design. Telematics is a platform of communication which collects data from a vehicle in real time and transmits it to the data analytics center from which the data is then processed and sent back to the vehicle as per the selected service application. Telematics insurance is expected to grow into a mainstream automotive insurance option. In the current market ecosystem, the major drivers for the global automotive telematics insurance market are dominated by the growth in technology reforms in vehicle design, thus enabling the integration of various smart services. Some of the drivers for the industry are high customer engagement through usage-based insurance (UBI), which offers better pricing and feature flexibility for end users, growing number of fraud claims, and increasing insurance premium. Some of the major challenges for the industry are data management and automotive insurance industry’s resistance to the innovative model. The automotive telematics insurance market has a low penetration ratio in the automotive insurance market majorly due to misconceptions such as the insurance claim process, the data recording and tracking methods, and privacy issues, among others. Many of the developing economies such as China, India, and others strive in the automobile sector for a growing GDP. The global volumes of automotive vehicles are expected to grow at a CAGR of 3% during the forecast period. The global parked vehicle volume is one of the keys to analyze the global potential of the automotive telematics insurance market. The following figure depicts the recorded volume for 2016 and 2017 and expected volume for the forecast 2018-2022. The global parked vehicle volume is expected to increase at a sustained growth rate. A high gradient for Passenger Vehicle (PV) indicates higher growth as compared to Commercial Vehicle (CV). In 2017, the global automotive telematics insurance market volume was estimated 24.7 million units, which is expected to reach 169.8 million units by 2022, as illustrated in the following figure. Factors owing to this growth are an increase in the availability of digital technology, growing safety concerns related to driving behavior, and an increase in the competition in the automotive insurance market, among others. The estimated CAGR for the forecast period 2018-2022 is 37.20%. The market estimation considers a detailed, in-depth analysis of factors impacting various regional markets and industrial trends. The highest growth period is 2017-2019, and the estimated cumulative growth rate for the period would be ~245%, which is led by the surge in the number of new market entrants and automotive telematics insurance product launches. The global automotive telematics insurance market is expected to be driven by the various global technological companies that accelerate the growth of automotive telematics insurance policies. Octo Telematics is one of the major global players which operate in all the three regions. Some of the key strategies adopted by the company were that of partnerships, joint ventures, and mergers and acquisitions (M&A). A major acquisition by Octo Telematics was of the UBI asset of Wills Tower which developed a strong technology research and solution development partnership for telematics-based products. CalAmp is an electronic manufacturing-based company which ventured into telematics products. Its main strategies have been M&As and utilizing its own capability to enhance products. CalAmp invested in equity stakes in ThinkNet GmbH to develop connected vehicle solution for the Europe automotive market. Another strategic acquisition by CalAmp was that of LoJack, which provides vehicle tracking, location, and retrieval services to the automotive market in the U.S. This acquisition gave CalAmp access to the vast customer base in the U.S. and additional market capabilities. Cambridge Mobile Telematics is also one of the key service providers in the U.S. It has collaborated with multiple insurance companies to provide telematics driver solutions and backend supports. Some of the emerging automotive telematics insurance solution providers such as Amodo Ltd, Insure Telematics Solution, and The Floow Ltd. originate from the European region. The overall environment of the automotive telematics insurance market is highly co-dependent which enables healthy competition as well as market development at an optimum time and cost.